Hello music lovers coast to coast! It’s Andy Gesner and the staff from HIP Video Promo, here with a brand new clip from a fantastic new duo with a sensational album on the way. The Quiet Hype drops this March, and when it does, the world is going to know all about Jupiter Rising – but they’re still not going to know how to categorize the act. Elements of synthpop, hip-hop, R&B, guitar rock, Eighties new wave, psychedelic funk, European electronica, and even American folk are all apparent in the duo’s music. That Jupiter Rising forges radio-ready, immediately accessible tracks from these disparate sources is testament to their pop smarts, their sense of music history, and their ambitious production. And let’s not forget their vocal talents. Spencer Nezey and Jessie Payo are charismatic presences on the microphone; they’re flexible, approachable, and adventurous. What’s more, they complement each other perfectly: Nezey, is, by the standard of contemporary male vocalists, uncommonly sensitive, and Payo is, by the standard of female singers, uncommonly tough. They trade stanzas and line, respond to each other, harmonize beautifully, and join their voices together on their songs’ undeniable choruses. Nezey takes the first verse of “Falling Away” and Payo handles the second: it’s a dialogue and a call-and-response; a relationship problem examined from two trenchant and very different perspectives. And when they come together for the house-shaking refrain, well, you’ll know you’ve been sung to. 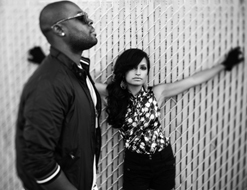 The duo has already had substantial national exposure – and even chart success. If you’ve been to a sporting event at stadium recently, there’s a good chance you’ve heard Jupiter Rising: Major League Baseball and Fox Sports both licensed “Go!”, their last single, for use in their productions. The propulsive “Go!” hit #24 on the Billboard dance charts, and also featured in Disney Channel’s Jump In! and Wendy Wu movies. And for a new act, they’re certainly no strangers to MTV: Jupiter Rising has placed music on The Hills and Making The Band, and the duo gave an in-person performance on an episode of My Super Sweet Sixteen. Nezey and Payo are naturals for the video channel – they’re telegenic, their personalities are outsized, and unlike some notorious pop marriages of convenience, the two look terrific together. They’ve got screen chemistry that can’t be faked. Video director Andrew Gura (Kelly Rowland, Saul Williams,Young Dro) takes advantage of that chemistry in the colorful clip for “Falling Away”. He puts the Jupiter Rising vocalists front and center, and allows them to dominate every frame they’re in together, bodies in motion, singing at the camera with passion and authority. Gura is well known around Los Angeles for his kinetic pop clips, but his real specialty is viral video – he makes spots that are meant to be circulated and get people talking. He’s raised the profiles of many California artists, and the “Falling Away” clip seems sure to do the same for Jupiter Rising. There’s a narrative here, too – a couple of polaroids featuring the musicians are lost in the cityscape, and they animate in the hands of a pair of street dancers. But the focus is on the two singers, and they deliver with video performances that attest to their considerable talent and charm. It’s our pleasure to be working in tandem with Kristen Worden-Harris at Croshal Group to bring you this hot new clip. If you need more info, call Andy Gesner at 732-613-1779 or e-mail us at info@HIPVideoPromo.com .